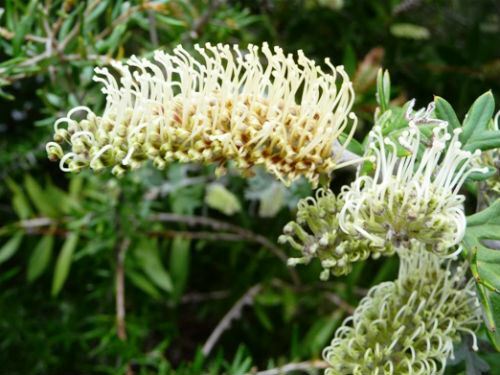 Grevillea willisii is a spreading shrub reaching a height of three metres with a similar spread and is a native of northern Victoria. The leaves are grey-green, stiff and lobed. Large creamy-white toothbrush flowers are an outstanding feature. Spring is the main flowering period when plants become covered with the nectar-rich blooms. Grevillea willisii, in our cold climate garden, has proved to be hardy, free-flowering, frost tolerant and with low water requirements once established. The species is classified as rare with limited distribution. There are two forms. The typical form has short leaves, up to six centimetres long and develops into a spreading shrub. The long-leaved form grows into a small tree with leaves up to 14 centimetres long. This form may be extinct. The last collection was made in northern Victoria in 1973. We first saw the species in the National Botanic Gardens, Canberra during a trip south. The plants were so impressive that it went down on our must acquire list. Fortunately we came across the species, in a Canberra nursery, during the same trip. Propagate from cuttings treated with hormone gel. We use red Clonex for all cuttings.